Pretty much everything I write on this blog is true or will eventually be true, whether it’s about economics, the stock market, the media, Bay Area real estate, internet journalism, intellectualism, web 2.0 valuations, or the post-2013 demise of the SJW narrative. The truth always prevails, but sometimes it takes a little while to break free from the web of misinformation and false narratives that are so appealing but also wrong. We’re seeing this with the post-2013 SJW backlash, in addition to the ‘alt right’, Red Pill, MGTOW, NRx and the ‘Dark Enlightenment’, Gamergate HBD, ‘frog Twitter’, and the election of Trump. And through this blog – which began in 2014 as these politically incorrect ideologies and movements were beginning to burst through like a battering ram against the fortress of leftism – I am proud to be a part of it, too. By unleashing the frog that lies within us all, we can make America great again. Who else is feeling deplorable today? Leftist assumptions about economics and finance are being repudiated by the internet’s army of fact checkers. For example, through the writings of Robert Shiller (a Noble Prize economist who shills for the left) and Michael Lewis (another liberal, who wrote The Big Short and Flash Boys), the left conveyed a narrative that high frequency trading was an unalloyed evil – an assumption that for many years went unchallenged by the ‘general public’ until only recently, as millennials on Reddit (as part off the post-2013 SJW backlash) eventually learned that high frequency trading actually helps traders by lowering transaction costs and speeding order executions. 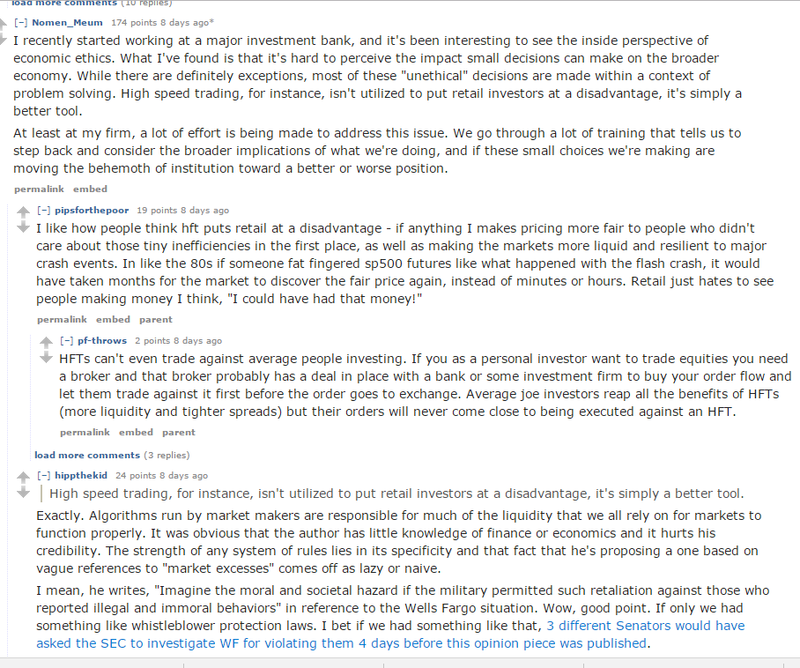 Working at an investment bank conveys authenticity and authority in the eyes of other ‘redditors’, who up-voted the post in agreement. In many ways, finance and economics could be considered ‘STEM’, as it’s considered intellectually rigorous and involves empirical evidence, math, and number-crunching, and that’s why it ranks high in the hierarchy of degrees in terms of respect, along with philosophy, physics, and mathematics. This was from /r/philosophy, not a ‘right wing’ sub, so it’s not like I cherry picked a sub that agrees with my view, and I could easily find more examples beyond the ones in the screenshot. But the reality is, there are a lot of misconceptions promoted by the left about algorithmic trading that are are easy to refute, and I have done so here. It’s nice to see so many people coming around to reality, rejecting the ‘blame the rich/banks’ mentality that was so pervasive in 2008-2012. The same goes for the much maligned 2008 bank bailouts, which many people, in agreement with posts I wrote in 2011-2015, realize were necessary from a utilitarian standpoint, and helped the economy by stemming the bleeding from the ailing banking housing sectors so that the healthier sectors such as web 2.0, payment processing, information technology, and retail could thrive. The bailouts may have created moral hazard but indirectly created trillions of dollars of wealth in the form of rising asset prices, economic growth, and improved confidence – all at nearly no cost (as the bailout was funded with near-zero yielding debt). This is just one of many examples of how the truth always prevails. A reality-based worldview based on rationalism and logic always prevails. Leftists, who have to use misinformation and emotion to convert the uninformed to their causes, are losing.